It is mandatory for every student in the third and fourth semester of FDP under CBCSS to participate in any one of the Social Service/Extension Activities of the college. It is compulsory for a student to secure a minimum of 40 hours of attendance for these activities failing which he/she may not be considered for graduation. The attendance of club activities shall be forwarded to the Controller of Examinations along with the statement of CE marks of 4th semester. Our college offers the following club for the students to choose from and to engage themselves in co-curricular activities. Each club functions under the guidance of a Convener. To provide help & support in case of necessity. Conducted random surveys among girl students to gain insights into the problems and challenges faced by them in the college. Collaboration with the Literary club in organizing a one day workshop titled “My Career, My Life” on 21.10.2014. Apprehensions regarding threats & job satisfaction in print and visual media were discussed with eminent journalists. Activities were focused upon the theme 'Women and Activism'. One-day workshop on self-defense conducted by Master Sivakumar on 27-10-2013. An interactive session with Kumari Arya Suresh was held in the month of October, 2013. The members of the Unit worked hard to make the drive against substance abuse a huge success. They designed posters and campaigned actively. International Women's Day was celebrated on 10-03-2014. The Unit collaborated with the Literary Club and conducted a one-day Women's Writing Workshop. The chief guests for the day were Dr. J Devika, Writer-activist and Suneetha Balakrishnan, writer-creative writing trainer. Students also took part in the reading session in the afternoon. Creative texts were read and discussed. To discuss and analyze recent literary works and new developments in the literary field. Arranged book exhibition in the library hall on Reading Day, 19th June 2015. 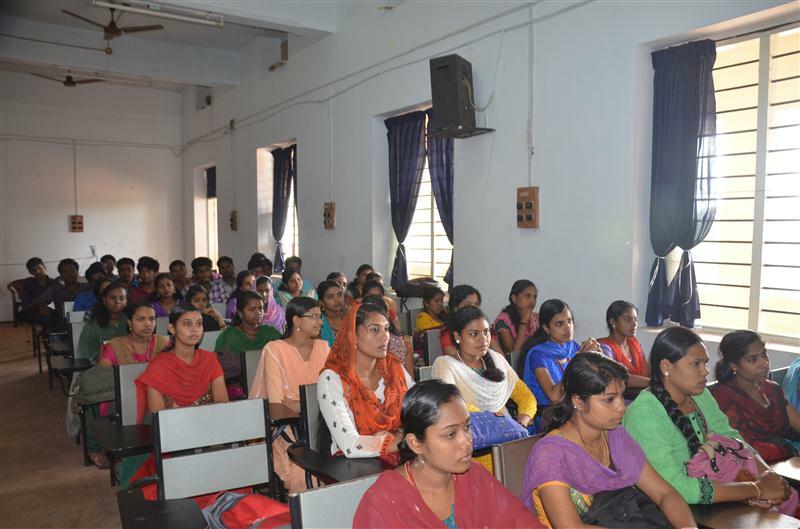 Organized a one day workshop titled “My Career, My Life” on 21.10.2014 in collaboration with the Women’s Study Unit. Opportunities were given to students to interact with eminent journalists Ms. Mini S.K and Ms. Sreeja. Questions were asked on print media, visual media, job satisfaction & threats in the field. It was followed by the session “Writing for the Media” by Dr. Manu Remakanth, faculty of our college. It was followed by the session “Writing for the Media” by Dr. Manu Remakanth, faculty of our college. Literary Club started its activities for this academic year on 13 October 2013. About twenty-five members were selected from various departments and meetings were held at regular intervals to discuss recent literary works and developments. The Club actively participated in the Anti-Drug Campaign organized in the college on 29 November 2013 through poster presentations. Literary club in collaboration with the Women Studies unit had organized a Women’s Studies Workshop on 10-3-2014. Eminent scholars J.Devika, Associate Professor, CDS and Ms. Suneetha Balakrishnan, Censor Board Member spoke on interesting topic such as creative writing. It was followed by a reading session where students read out literary pieces and critically analyzed each work. The workshop was well appreciated by the participants and the faculty. To provide opportunity to showcase hidden talent in curricular activities. To build communication skills through practice and participation. To provide a platform for students to express their views on various issues. During this academic year, 26 students from various departments enrolled in the debate club. The club coordinator explained the significance of debate clubs and the main requisites for a debate to the members. Students were given topics of their interest and the following debates were conducted. 3. Western culture influence in younger generation. 4. Twenty five students participated in a debate programme in Soorya TV on the topic-Which is more effective for curing a snake bite : Ayurveda or Allopathy? 5. Club members Abhinanda of BA English and Anchu of B.Com participated in the "All Kerala Debate Competition" at SN College, Kollam. To propagate the benefits of ‘getting back to nature’ for ones well-being. To spread the message of preservation and conservation of nature. Nature club activities were inaugurated by DrK.Vasuki I.A.S, Director-ANERT. She urged the students to connect with nature and learn from nature to lead a healthier, stress free and social lifestyle. This will naturally help develop a sense of preservation and conservation. Arranged class campaign and processions to highlight Environment protection on World Environment day. Implemented ‘Star Tree Grove” project with the aim of generating ‘Go Green’ campaign to create a better, greener campus. The project lists and discusses the trees associated with the 27 birth stars. A lecture on Mushroom Cultivation was given by Dr. S. Anilkumar on 22-10-2013 in the Seminar Hall. He made an elaborate presentation on the various aspects relating to the cultivation, propagation and marketing of mushrooms in Kerala. Students and teachers from several departments attended the seminar, which also included a demonstration on the preparation of mushroom bags for indoor cultivation practices. In addition, regular meetings were conducted to discuss about the recent developments in biodiversity conservation and environmental activities. To enrich and motivate students tofamiliarize with the views and ideas of the our Patron Saint Sree Narayana Guru. A quiz competition based on the topic ‘Sree Narayana Guru – Life & Vision’. A Group Discussion on the topic ‘Practicability of Sree Narayana Guru’s ideas in our modern life’. A Seminar followed by discussion on the universal prayer song Daivadasakam composed by Sree Narayana Guru. An elocution on the topic ‘The Psychological perspectives in Anukambadasakam’. A field trip to Sivagiri and Sree Narayana Gurukulam, Varkala. Sree Narayana Study Centre was formally inaugurated this year by Sree Dharmachaithanya Swamikal of Adwaithasramam, Kottayam. A class on Daivadasakam and its significance in the present world was highlighted by Swamikal on the occasion of the centenary celebrations of its composition. The Hindi translation of Daivadasakam by Dr.Mahesh. S, Asst.Professor, Department of Hindi, was released and recited on this occasion. On 20 June of 2014 the conveners of the club drafted the plan of action for the year after discussions with the student members of the club. 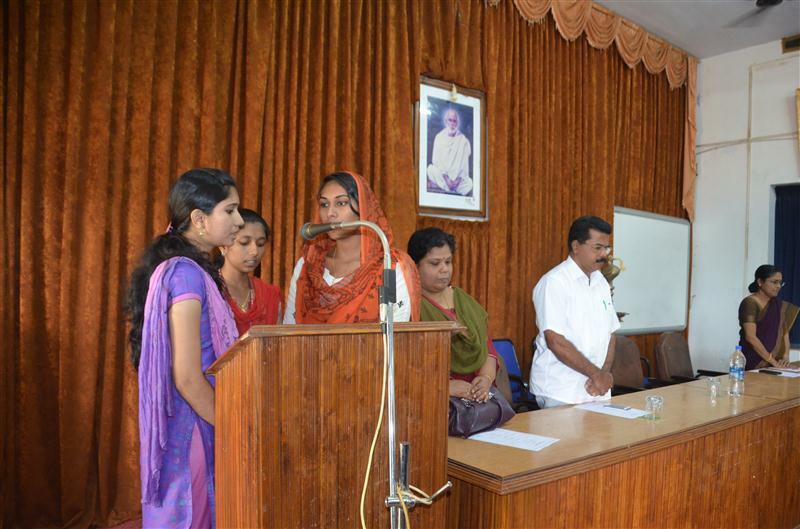 The joint effort enabled the club to produce its first fruit which was ‘The Vayalar Anusmaranam’ conducted on 22 October, 2013. In association with this event a light music competition was organized by the club. The competitions were restricted to the songs of Vayalar. The winners were awarded cash prizes sponsored by the PTA. The ensuing event organized by the club was an ‘Anti-drug and Anti awareness programme’. All the clubs participated actively in this event. The active support given by the club members and the conveners brought success to the event. The club then shifted it focus on getting the students prepared for the inter- college arts fest. A team of nine students participated in the following fests – Equinox, Aufait and Ivano fest. The Arts Fest organized in collaboration with the college union had the participation of all the departments. The winners were further trained by the club for the University Youth Festival. The guidance and encouragement by the Convener and Co- conveners as well as the financial assistance provided to them together with the sincere efforts of the members of the club enabled the students of the college to upgrade themselves to a higher level in the field of arts. Convener - Smt. Sini V.
A one-act play was staged by the members of the club in connection with the mass campaign against drug abuse on 29/11/2013. To Promote health and wellness through a variety of programs and activities. These programs seek to make students more aware of the consequences of unhealthy behaviours by providing educational life-skills training and healthy life style choices. A talk on Health & Hygiene by Mrs.B.Pameela, Dep. District Educational & Media Officer, D.M.E.Office, Tvm on 30th October 2014. She gave an overview of unhealthy practices and the measures to be taken to adopt healthy life-skill behaviours. With an aim of enhancing the mental health of students, "Tips for enhancing mental health" were displayed on the Notice Board of various departments by Health Education Club members on 10 October 2013, the World Mental Health Day. In order to create awareness among students about the ill effects of alcoholism and drug addiction and to caution students against it, members of the Health Education Club conducted Class Campaigning on 6 December 2013. Notices regarding the ill effects of alcohol and drugs written by the students were also distributed. On 4 February 2014 (World Cancer Day), members of the health education club collected Pamphlets from the Regional Cancer Center, Thiruvananthapuram. The pamphlets were distributed among the students. A Diabetes Detection Camp for the teaching and non- teaching staff was organized on 17 February 2014 with a team from the Govt. Nursing College, Thiruvananthapuram. As part of making students aware about the importance of dental hygiene, a Free Dental Medical Camp for students, teachers and non teaching staff was conducted on 11 March 2014. Eight doctors from PMS College of Dental Science and Research, Vattapara, Thiruvananthapuram were present. 156 students availed this facility. Students having dental problems were identified and those below poverty line were offered free treatment at PMS Dental College. A class on 'Yoga techniques' by Dr. Anjana.R, Assistant Professor, Department of Psychology, S N College, Chempazhanthy was conducted on 14 March 2014. To create awareness of recent policy changes. An orientation class on 29th October 2014, for newly inducted members regarding the aims and objectives of club. Paper presentations on the topic ‘Waste Management” on 10th November 2014. Interdepartmental Quiz competition on 24th February 2015. Planning forum of Sree Narayana College Chemphazhanthy started functioning this year on 8/8/2013, as part of the Extension Activities for the III & IV semester students. Dr.Jameela.V.A, Head of the Department of Economics was the convenor and Prof. Vijayakumar, (Associate Professor, Department of Commerce), Prof: Vinod.C.Sugathan (Assistant Professor, Dept:of Economics, Prof: Raji Raveendran, (Assistant Professor, Department of Economics) were the guiding members. On 14/8/2013, the enrolment procedure was completed with 34 student members of various departments. The activities of the planning forum commenced with an Orientation Class to the students on19/11/2013.The objective of the planning forum was to provide a platform to the students to discuss and debate on all major challenges of the day and help them to respond and react so as to become responsible citizens. A number of activities were carried out under the auspices of this club, which includes Quiz competitions, Lecture, discussions and Assignment work. Quiz competition conducted on 3-9-13 covering topics from GK to sports, movies, literature, business and governance. The theme of the Poster Exhibition was Clean Campus. The posters were well arranged in room No-1 by the club members. All the distinguished guests visited the exhibition hall and encouraged the students by giving suggestions. The Exhibition lasted till 1.30 pm on 29-11-2013. The students and teachers of various Departments came to see the poster exhibition. The exhibition provided an opportunity for interaction between the student community of the college and the members of the Planning Forum, and also helped to create an awareness among the students about the importance of keeping the environment clean. In the Lecture held on 11/2/1014 Mr. P.Vijayan IPS, City Police Commissioner, Thiruvanathapuram in his keynote address stressed the importance of human resource as the most important asset of the 21st Century. The speaker pin-pointed the significance of exploring the potentials of youth in molding the future of India. He expressed his hope that India will definitely become a super power beating China in 2030, provided we utilize the potentials, knowledge and skills of the youth. Earlier the Principal in his Presidential Address pointed out that India is going to cross the population of China in 2030 and India would become a country with maximum youth in world population in 15 years. Hence we have to plan the strategy to make use of their potentials in tackling the unemployment problem which will get aggravated. The Planning Forum has undertaken a Socio-Economic Survey with the help of the members in the first week of March, in order to find out the immediate problems of the society around the college. To serve as a powerful tool for empowering student community for a better society. Conducted classes to inculcate an awareness of the PPP. The club members collected local history of certain rituals and ceremonies prevailing in society by interviewing the older generations in their native places. An awareness class given for the club members against the use of intoxicants. Students were trained to develop good habits, to respect elders, to consider needs of companion, fellow beings, younger generations and to show kindness towards the needy & poor. These are all essential qualities needed for the well-being of the society. The club conducted an Awareness Class on drug abuse on 29.11.2013. Class campaigning and poster presentations on the ill-effects of drug abuse were carried out. To capture pictures of all college events. To provide opportunity to learn from experienced photographers to improve photography skills. To provide opportunity to make ‘short films’ on campus related issues. To encourage participation in photography contests and thereby build confidence. To promote art and aesthetics in the campus. Generated a documentary Sparsam, depicting the real life story of an old lonely widow living near the college and captured the generous attempt of the NSS unit renovating the dilapidated house, arousing feelings of compassion and empathy. Organised a Career Fest, “Ambition” on 6.11.2014 in which the media club members gave an overview of various opportunities available in different disciplines for career advancement through posters, pamphlets & videos. Organised a ‘Spot Photography’ exhibition on 25.3.2015. It was inaugurated by Dr.Vasuki I.A.S. This event provided platform for our students to showcase their skills in photography. Students from all departments exhibited more than 100 photographs. Photo Team and Writing Team. The various teams worked well to accomplish their assigned tasks. Photo Exhibition conducted on 4 November 2013, being the first event organised by the Club was a big success. More than a hundred photos taken by the students were exhibited. It provided a platform for young, aspiring students to exhibit their photographic talents. On 29 November 2013, an Anti Drug Campaign was organized in the college and Media Club spread its message in a crystal clear tone through a well knitted skit and beautiful hand drawn posters. The Evergreen Actor of Malayalam Cinema Sri Prem Nazir was commemorated by a Quiz competition held in his honour on 17 January 2014. A Class on DSLR Photography by Mr. Dev Das was organized on 6 February 2014. It motivated the students and also gave an impetus to amateur photographers to pursue it as a career. A news letter titled "Campus Voice" was released by the Club as part of the inauguration of the Spectrum Seminar Series on 18 March 2014. The Event Management Team discharged its duties well by organizing various programmes in a befitting manner. The efforts of the Photo Team are commendable. Photos taken on occasions like Onam Celebrations, Shanker's Day, Blood Donation Camp, Self Defence Workshop etc. were uploaded on the official page of Media Club in Face Book. To inculcate scientific temper in students. To help students develop a scientific way of learning. To develop awareness and concern for scientific issues in personal, social, environmental and technological contexts. Uniting students, teachers and researchers through open discussions for deepening their knowledge across disciplines. The Science Club was formally inaugurated by Sri.P.Radhakrishnan (Rtd. Deputy. Director, L.P.S.C., ISRO) by a talk on “Human Space Exploration”. 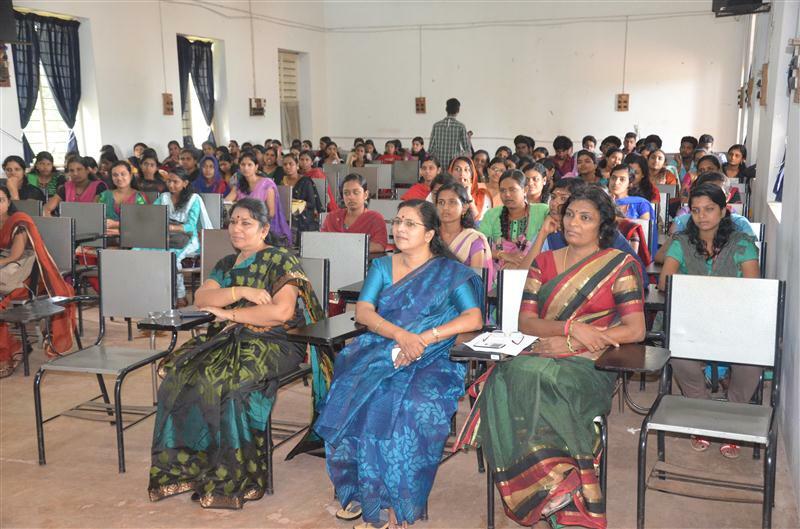 The program was organized in association with Breakthrough Science society, Trivandrum Chapter. The Science Club celebrated the success of Mars Mission ‘Mangalyaan’ on September 24, 2014 by a video presentation on ‘Mangalyaan’. National Science Day was celebtated on 27.2.2014 by a talk on"LIGHT AND SHADE OF SCIENCE” by Dr. B. Premlet, Associate Professor, Dept. of Physics, T.K.M. College of Engineering, Kollam. A Quiz competition was conducted for the members of the Science Club and prizes distributed on 27-03-2015. A Wall magazine was released for displaying science news, events, important dates, new discoveries etc. The Science Club in association with the Department of Chemistry, collected samples of water from the wells & ponds within the limits of Gurukulam Residents Association for Scientific Quality Assessment.The detailed Chemical, Physical and Biological analysis of the collected samples of water was carried out effectively with the help of Scienists and Researchers of the National Centre for Earth Science Studies, Thiruvananthapuram. Notice regarding this service was circulated among the residents of CGRA Residents Association, Chempazhanthyon 08-12-14. Sample collection was done on 10-12-2014 by our students under the guidance and supervision of Dr. V. Bhagavathy and Sri. S. Abhilash along with the scientists of NCESS. Sri. Prabhalyan, Secretary, CGRA, was very kind enough to extent all possible helps. Samlpes were sent to NCESS on the same day itself. The Report of the analysis was handed over to Smt. VimalaKumari, Councilor, Njandoorkonam Ward by our Principal Dr. L. Thulaseedharan. The same was then handed over to Sri. Prabhalyan, Secretary, CGRA, in a function, “SOCIAL EXTENTION PROGRAMME-WATER ANALYSYS” held on 26-3-2015. Science club was activated this year on 25 October 2013. Thirty one science students were admitted in the science club according to their preference. In the first meeting, on the same day itself, programs which can be organized in the college by the students were discussed. Public oriented programs for awareness of 'science in society' can be implemented by the science club. In November 29, 2013, the club activities were formally inaugurated by our Principal Dr.M.Devakumar. On the same day students of science club arranged posters in the college campus regarding Drug Abuse and the steps to be taken in the college level against the use of drugs and drinks. National Science day, 28 February 2014, was celebrated with an invited talk on the focal theme 'Fostering Scientific Temper' by Dr. Krishnan Sivasubramoney, Associate Professor of Psychiatry Medical College, Tvpm. A Poster Exhibition by the club members was also arranged on the occasion. The Red Ribbon club is functioning very well in the college.The activities of the club started on 01.09 2013. The NSS Programme Officers Smt N.R. Vineeetha & Smt. Aiswarya.A.S could lead the club in a systematic and disciplined manner. The club organized several informative programmes and humanitarian activities in this college. a) Blood donation awareness campaign was conducted in our college with the assistance of KSACS (Kerala State Aids Control Society).The Principal Dr.M.Devakumar inaugurated the programme. Dr. T. V. Saravanakumar (Asso. Prof. Obstetrics & Gynecology & Deputy Superintendent in SAT Hospital) interacted with the students and explained the merits and importance of blood donation. The awareness was class taken by Dr. Kala, working in the Department of Pathology, SAT Hospital. b) Voluntary Blood donation camp was conducted in our college in association with SAT Hospital. 44 students and 3 teachers donated blood. Blood group checking was also carried out and blood group checking cards were distributed. c) A Directory of blood donors was prepared by the NSS volunteers. d) Distribution of certificates for blood donors was carried on 3/10/2013. a) AIDS awareness rally was conducted in our college.100 RRC members participated in the rally. This programme was a great success. Along with this an AIDS awareness programme was conducted in Association with KSACS and Rotary Club Kazhakkootam. The awareness class was taken by a project fellow of Kerala AIDS Control Socitey. b) The Posters and booklets dealing with the themes of AIDS awareness were distributed among the students. c) The Principal inaugurated the Red Ribbon wearing ceremony. Red Ribbon club of our college has been doing a kindful service to the poor patients by donating blood without any monetary benefits. Our students sincerely donate their blood to any hospital in case of an emergency. Amal.J.S (II B.Sc Geology) & Sujith S.S (II B.Sc Chemistry) got 1st and 2nd prize in District Level Competition on AIDS day celebrations, respectively and participated in the State level competitions. Imthiyas. A (I BA Sociology), Rajesh Kumar. R (I BA Sociology) and Robin.L (I B.Sc Psychology) participated in the Essay Writing Competition. This programme was organised by Kerala State AIDS Control Socitey. A class on Positive Talking was conducted on 27.12.2013. Sri. Suresh, an HIV patient shared his experiences with the students. This interaction was an eye-opener to the students as they were able to know the hardships an HIV-hit person undergoes. This could remove the apprehensions of the students about the horrors of HIV-AIDS. VrindaVijayan (I1B.A.History), Anuja A.S (11 BA Politics) participated in three day Residential Programme on 'Life skills for Red Ribbon Child Peer Educators' at Mariarani Training Centre, Chavadimukku, Sreekaryam from 16/02/2014 to 18/02/2014. Red Ribbon club plays an active role in enlightening our youth about their vital role in society and also in spreading the message of 'Blood is Precious'. We are sincerely thankful to all supporters for strengthening the club day by day. The ARSH (Adolescence Reproductive and Sexual Health) state plan provides the formation of Teens club in the college. The club started its functioning in the college from the academic year 2012-2013. The National Rural Health Mission and Health Service department has provided all assistance to the programme. The NSS Programme Oficers were appointed as its coordinators. A Health Corner was also organized as part of the Teens club. A weighing machine, height measuring device and a Body Mass Index Chart purchased in the last year are being used in the Health Corner for the students. This year teens club started its programme from Nov.2013. NSS Programme officer Smt.A.S.Aiswarya attended the programme officers meeting at NRHM office at Thampanoor. Principal Dr.M.Devakumar, guided the functioning of the club. The first programme on 2.12.2013 was a Medical Camp & blood donation awareness class by Dr. Saravana Kumar (Deputy Sptd., SAT Hospital, TVM). Feature films which gave awareness about blood donation and diseases like HIV -AIDS were shown. About 200 students got benefited from the class. The volunteers appreciated the move of the programme officers for giving them such a rare opportunity. 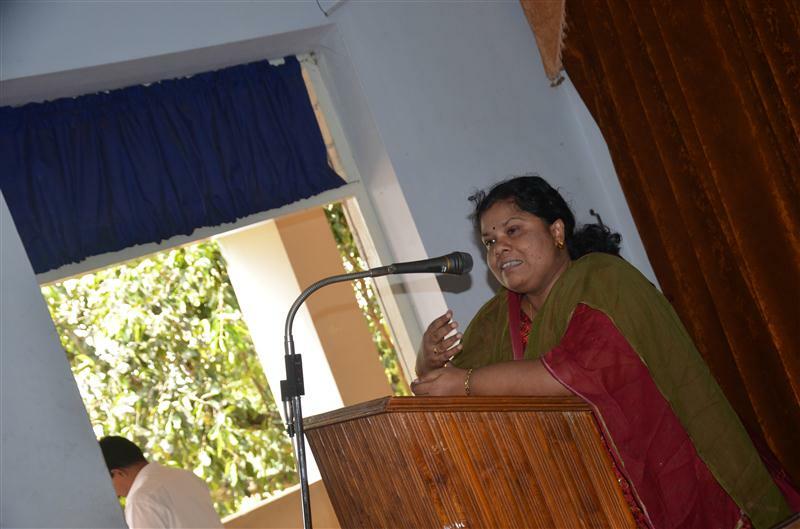 NSS programme officer Smt N.R Vineetha delivered the Vote of thanks. A Health Survey was conducted by the volunteers at Chenkottukonam Residential Area on 23.12.2013 .The analysis showed that 43% of the study area are suffering from life style diseases like blood sugar, High BP etc. So an awareness class on 'Life Style Diseases' was conducted by Dr.Beenny P.V (President, IMA, Kazhakootam) on 24.12.2013 at Govt.LPS Chenkottukonam. The students and the people in the study area participated. Several students and residents in the study area raised doubts and queries which made the seminar a lively experience. The class was very interesting and useful to the students and the public alike. Teens Club conducted a medical camp for the students of our college on 8.3.2014 at college Guest Room. The aim of this camp was to detect anemia among students. Dr. Gayathri, and Dr. Devaraj along with Mr. Balendran, Health Superior and Mr.Vinu, Lab Assistant from Pangappara PHC collected blood samples for analysis. As per the direction of the doctors, anemic students were sent to PHC, Pangappara for further medical care. Free drugs distribution in cooperation with PHC, Pangappara for the eradication of filariasis was conducted on 20.3.2014 at seminar hall. Thus the programmes of the teens club were very beneficial to the students. To build an awareness among students of their rights as Human beings residing in a civilized society. Commemorated Human Rights Day on 10th Dec 2015 by organizing a special talk on “Human Rights Issue”. Dr. A.V Alexander, Principal, St Dominic’s College, Kanjirapilly delivered the special talk highlighting the idea that every day is human rights day and that everyone is entitled to the full range of human rights at all times anywhere in the world. To address problems related to examination fear, stress, anxiety, peer pressure and adjustment to college environment. To assist students in choosing careers and in identifying job opportunities. To provide soft skill training to equip students to face interviews and group discussions. Several activities involving the students were conducted to assist them in choosing their careers and helping them in identifying opportunities. One such programme was the interactive Session on “Changing Job Scenario & How to win in the workplace of the future?” on 20.2 2015. The Resource Person was Sri. Manu Gopinath, an alumnus of our college. Sri.ManuGopinath currently serves as the Global Head of HR and Head of International Operations - UST Global, California. Individual counselling and guidance was provided to students who requested for such help. They were educated upon the various career options available to them. A special reference section has started functioning in the college library which has books on various careers, competitive exams and self-help books on personality development. This section is updated regularly after seeking feedback from the students. Career orientation is given to students by senior members of the faculty and every department offers career counselling to their students which is conducted by the respective tutors, especially for final year students. The Career Guidance & Placement Cell carried out a Student Needs Assessment Survey on Career Development for final year UG students. The Cell has been facilitating campus recruitment and job fairs and has been equipping them to face interviews and group discussions. The college has a few computers with internet facility exclusively for students seeking the help of the Cell. Internet facilities are made available to the students and they are given assistance to make use of online job hunting possibilities.The Cell provides updated information on new courses, colleges and opportunities to the students and they are encouraged to seek new possibilities in their career. Around 108 students were guided for higher studies by different department faculty members in their respective subjects. Assistance for part-time jobs was provided to 24 students. 18 students were selected for BPO and IT related jobs. The Physical education department of our college actively assists state and national level players secure central and state government jobs and around 22 students have been placed so far.